Terry Pratchett: If you’re looking for a marketing post this isn’t it. The vast majority of Rippleout posts are related in some way to marketing, but in this case not. No hard feelings if you choose to leave – but check back soon. This is a thank you, a celebration and a recognition of a man who was both incredibly talented and phenomenally brave. 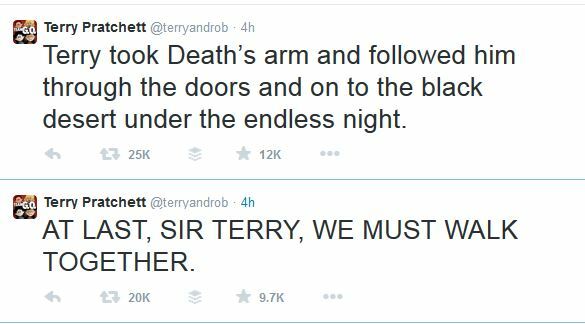 I have to say that hearing the news that Sir Terry Pratchett had died was one of the saddest things I’ve heard in recent memory. I never met the man, yet feel that he was such a huge part of my life in terms of influence, humour, and general outlook, that it really did get to me. Whilst the thoughts are good in themselves, there’s a real pleasure in knowing that you’ve shared an experience with someone else – probably millions of people, given the seventy books Pratchett published, and the millions of copies purchased. Despite having said this isn’t about marketing, in a way it is. Marketing is, after all, a little bit about storytelling, and Terry was the greatest of story tellers. He wove his novels together with dialogue – the books are essentially conversations, with less narrative description than stories from a lot of other authors; this means they are generally full of more humour, more tragedy, and more fantastic quotes. Moreover, Terry Pratchett was the man who made me read. I am and will always be an avid reader, and I believe this has made me a better writer, and a more rounded individual. Pratchett introduced me to fantasy, comedy, and books with a deeper meaning. Without Terry Pratchett I probably would never have read a huge number of books, from Dune to Aristotle. In closing, I have to say that the way in which his Death was announced was in keeping with, at least my perception of, him and his life. 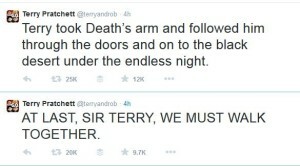 Thankfully, one thing Terry wrote that I firmly believe in means he will, for the foreseeable future anyway, live on. I’ll leave you with this, I’m off to read Mort.